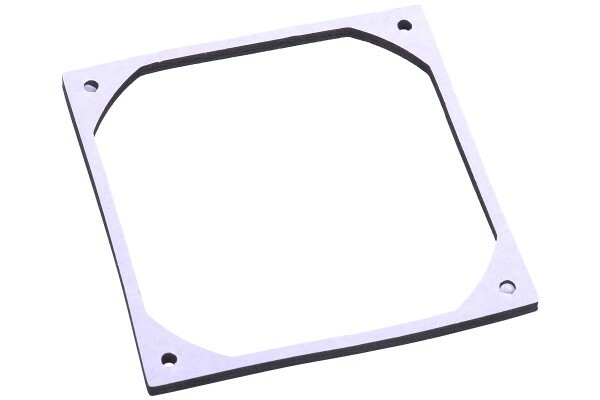 Gasket for ideal fan installation on radiators or in enclosures. To increase the efficiency of fans on the radiators respectively in the water cooling system, Phobya offers another innovative product which allows great improvements with little cost and effort! A certain percentage of airflow always leaksm as the fan frame does not fit perfectly flush with the radiator frame or enclosure. To minimize this loss, Phobya has designed this special gasket! Self-adhesive tape on one side allows quick and easy fixation to a component of your choice. Now just lay the fan on the gasket and tighten the mounting screws. Allowing compression to a thickness of less than 1mm, the gasket will seal the gaps between component and fan, eliminating leakage and making your cooling system even more efficient! The gaskets are already perfectly pre-cut to the differrent fan sizes, requiring only fixation to the radiator and then allowing fan installation!